I read this word "optos" occasionally and do not know what it is. Even a Google search fails to define optos. So, if someone would define, it would be most appreciated. two leds using special spectrums of light. One led emits light, the other led detects the light. Optos are normally closed, when something breaks the beam(like the ball passing between the LEDs) the circuit goes open and the computer detects that. Optical switch. A pair of infrared leds, one sender, one receiver pointed at each other. The switch is closed when the light passes from one to the other. When the ball breaks the light path, it's considered open. Easiest comparison would be the opto on garage door openings to stop the door from closing if something is blocking the beam. Optical switch. A pair of infrared leds, one sender, one receiver pointed at each other. The switch is open when the light passes from one to the other. When the ball breaks the light path, it's considered closed. Technically optos are usually normally closed, and when the ball is there they are open because the receiver is not receiving the light signal. DCFAN's Avatar's Cat has Opto eyes. Thanks. That explains a lot. Now, how would optos apply for flipper uasge? Heighway Pinball talks about how they will be moving to optos for flippers. How would that work? Is it/are they? an advantage over flipper leaf switches? Could they be applied retroactively, i.e. refitted to and EM or early SS pin? 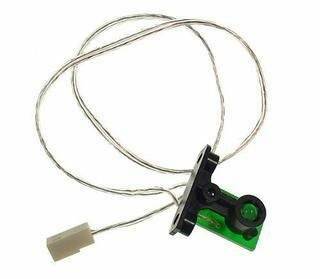 The opto for a flipper is simply pressing the button moves a piece of plastic to break the beam. The advantage is reliability over a mechanical device. But on older games you actually had more control over the flip if you wanted to play tricks like bumping a ball rolling down an inlane to the opposite flipper without a full flip. Easier to so with leaf switches. Yup, I had it backwards. Thanks for catching that; I'll edit it to fix it. I think I will keep my leaf switches. Not at the opto itself. The LED just puts out light. The photo-diode puts out current. Even a tiny bit from the photons it is receiving at all times. When it gets light from the LED this current increases. The rest of the circuit that determines how low the current should drop to be a closed switch and how high it should go to be considered open is on a separate circuit board. For example on Bally / Williams games you might have a 10-opto board mounted under the playfield. This supplies power to the LEDs and take the current reading from the photo-diode and translates this to open/closed for the switch matrix. I did say "usually" closed which is consistent with most modern Williams and Sterns I have seen. You can also have both types on the same game, as to what state of the switch is referenced by the diagnostic software to be considered a "normal" state. For example, a ball trough opto detecting the presence of a ball in the trough at game start is going to call this state "normally closed", where a vacant switch elsewhere may be considered "normally open". Technically the plastic is blocking the beam normally and pressing the button pushes it out if the way to unblock it. You get a nice strong flip consistently every time vs having to rely on contact switches which may sometimes not make good contact resulting in an inconsistent flip, particularly when they start to pit or get dirty or misaligned. simple, when something is fishy with the opto's, and you opto check em out. ziiiiiiiiiing!